We’re having a party, and you’re invited! 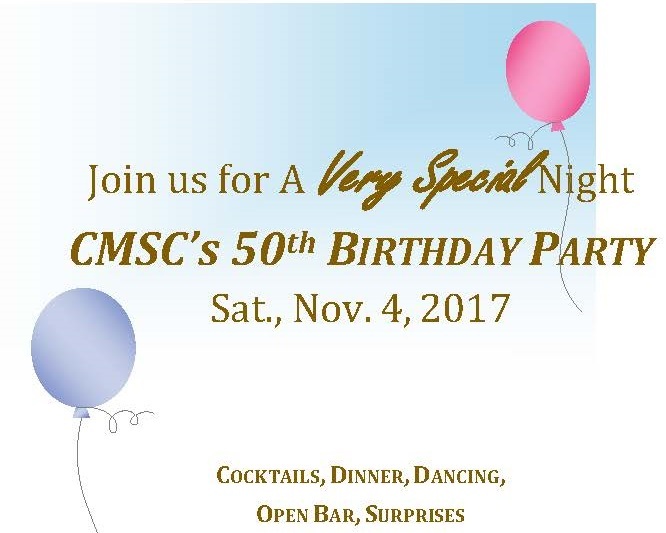 Join us for dinner, open bar, dancing to The Summer of ’65 and much more as we celebrate CMSC’s 50th birthday! Open to all current, former ski club members, guests – SPREAD THE WORD! To attend send your check (payable to CMSC) by October 30th to: Terri Lastovka, 2424 Chestnut Dr., Westlake, OH 44145. Email her with questions at talcpajd@earthlink.net. BOOK A HOTEL ROOM: Why not reserve a hotel room at the Hampton Inn Cleveland – Solon (6035 Enterprise Parkway, Solon) for the CMSC block rate of $89 + tax (2-4 people/room). You can book on line at clevelandsolon.hamptoninn.com or by calling 1-800-426-7866. Be sure to use the Group Code SKI and to book by October 20. Download flyer and send it to your friends!